Suzanne Marie Bonamici /ˌbɒnəˈmiːtʃi/ (born October 14, 1954) is an American politician serving as the U.S. Representative for Oregon's 1st congressional district, a seat she was first elected to in a 2012 special election. The district includes most of Portland west of the Willamette River, as well as all of Yamhill, Columbia, Clatsop, and Washington counties. A Democrat, Bonamici previously represented District 17 in the Oregon State Senate from 2008 to 2011. She was first elected to the Oregon House of Representatives in 2006. Bonamici was born in Detroit and raised in a small Michigan town. She earned her bachelor's degree and law degree from the University of Oregon, and was a legal assistant at Lane County Legal Aid in Eugene. Following law school, she became a consumer protection attorney for the Federal Trade Commission in the nation's capital. She went into private practice in Portland and represented small businesses. In 2006, incumbent Democratic State Representative Brad Avakian decided to retire to run for the Oregon Senate. She ran for the open seat in Oregon's 34th House District and defeated Republican Joan Draper 62%-36%. 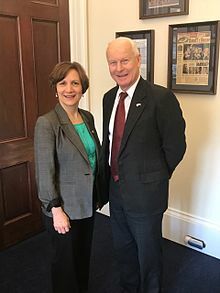 On April 30, 2008, Bonamici was appointed by Commissioners from both Washington and Multnomah counties to represent Oregon's 17th Senate District. The seat became vacant when Avakian was appointed Commissioner of the Oregon Bureau of Labor and Industries. She was sworn in on May 19, 2008. 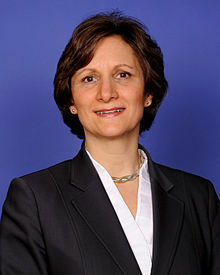 Bonamici was unopposed in the November 2008 special election for the balance of Avakian's four-year term, and was elected with 97 percent of the vote. In 2010, she won re-election with 64% of the vote. In early 2011, Bonamici's name was floated as a possible successor to then-Congressman David Wu after The Oregonian and Willamette Week reported Wu exhibited odd behavior and clashed with his staff in the midst of apparent mental illness during the 2010 election cycle. Following Wu's resignation from Congress, Bonamici announced her candidacy for the special election to replace him, touting endorsements from former Governor Barbara Roberts, former Congresswoman Elizabeth Furse, and incumbent Oregon Attorney General John Kroger, among others. On November 8, 2011, Bonamici won the Democratic Party of Oregon's nomination, winning an outright majority of the vote in every county in the district and capturing 66% of the vote overall, with a 44-point margin over second-place finisher Brad Avakian. She faced Republican nominee Rob Cornilles in the special election on January 31, 2012, winning by a 14-point margin. Prior to her election to Congress, Bonamici resigned from the Oregon Senate on November 21, and was replaced by Elizabeth Steiner Hayward in December. In November 2012, Bonamici won re-election to her first full term with over 60% of the vote. On July 31, 2014, Bonamici introduced the Tsunami Warning, Education, and Research Act of 2014 (H.R. 5309; 113th Congress) into the House. The bill would authorize the National Oceanic and Atmospheric Administration (NOAA) to spend $27 million a year for three years on their on-going tsunami warning and research programs. Bonamici said "the coastlines of the United States already play an integral role in the economic prosperity of this country and we must strengthen their preparedness and resiliency so they can continue to play that role going forward." She added that this bill "will improve the country's understanding of the threat posed by tsunami events" because it will "improve forecasting and notification systems, support local community outreach and preparedness and response plans, and develop supportive technologies." * In the 2012 election, Steve Reynolds was co-nominated by the Libertarian and Pacific Green parties. She is married to Michael H. Simon, a federal judge. They have two children, Andrew and Sara. Bonamici was raised Episcopalian and Unitarian, and now attends synagogue with her husband, who is Jewish, and their children. ^ "Suzanne Bonamici makes legislative resignation official". The Oregonian. November 21, 2011. ^ "About Suzanne | Suzanne Bonamici for Congress". Bonamiciforcongress.com. 2012-01-31. Retrieved 2016-11-11. ^ "OR State House 34 Race - Nov 07, 2006". Our Campaigns. Retrieved 2016-11-11. ^ "Bonamici named to replace Avakian in state Senate". Beaverton Valley Times. May 1, 2008. ^ "OR State Senate 17 - Special Election Race - Nov 04, 2008". Our Campaigns. Retrieved 2016-11-11. ^ "OR State Senate 17 Race - Nov 02, 2010". Our Campaigns. Retrieved 2016-11-11. ^ "Oregon Democratic leaders say they hope Wu gets help, put off talk of his political future". The Oregonian. OregonLive. February 19, 2011. Retrieved March 2, 2011. ^ "Bonamici announces bid for Wu's seat in Congress". Statesman Journal. Retrieved August 6, 2011. ^ "Endorsements". Bonamici for Congress. Retrieved August 6, 2011. ^ "Oregon - County Vote Results". Associated Press. November 9, 2011. Retrieved November 9, 2011. ^ "January 31, 2012, Special Election Abstracts of Votes Representative in Congress, 1st District Official Results" (PDF). Oregon Secretary of State. Retrieved February 1, 2012. ^ Staff (December 22, 2011). "Physician to sit in state seat". The Hillsboro Argus. Retrieved December 22, 2011. ^ Mapes, Jeff (December 21, 2011). "A Washington County commissioner at sea casts decisive vote to fill Oregon Senate seat". The Oregonian. Retrieved December 22, 2011. ^ Brown, Kate. "2012 election results" (PDF). OR STATE SEC OF STATE. Retrieved November 11, 2016. ^ "H.R. 5309 - All Actions". United States Congress. Retrieved September 10, 2014. ^ a b Marcos, Cristina (September 8, 2014). "House passes bill to authorize tsunami forecasting programs". The Hill. Retrieved September 10, 2014. ^ "Representative Bonamici Introduces Bipartisan Tsunami Warning Bill". Safer Coastlines. Retrieved September 10, 2014. ^ "Caucus Members". Congressional Progressive Caucus. Archived from the original on 22 October 2017. Retrieved 25 October 2017. ^ "January 31, 2012, Special Election Official Results" (PDF). Oregon Secretary of State. Retrieved March 25, 2019. ^ "Election Statistics, 1920 to Present". History, Art and Archives United States House of Representatives. United States House of Representatives Office of the Historian. Retrieved March 25, 2019. ^ "Voters' Pamphlet, Oregon General Election, November 6, 2012" (PDF). Oregon Secretary of State. Retrieved March 25, 2019. ^ Duin, Steve (August 6, 2011). "In the wake of David Wu case, accusations fly in Oregon's First District". The Oregonian. Retrieved August 9, 2011. ^ "Suzanne Bonamici". The Oregonian. Oregon Special Election voter guide. Retrieved January 23, 2012. Wikimedia Commons has media related to Suzanne Bonamici. This page was last edited on 26 March 2019, at 23:41 (UTC).